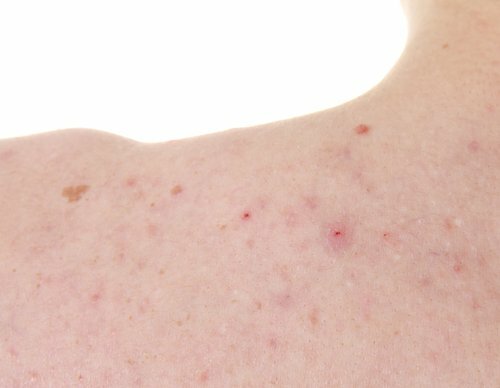 Home Specific Treatments How To Get Rid Of Body Acne Fast? Blackheads, whiteheads and pimples don’t only appear on the face. They can appear anywhere on chest, neck, shoulders, upper arms, back, or even lower body! In fact, body acne that appears on the back is so common it’s been nicknamed “bacne”. Read on here to learn why acne breaks on the body, best 4 ways to prevent and control body acne, how to clear body acne for good and dermatologists recommended extremely effective body acne cures and products. The same causes that lead to facial acne can also create body acne. Genetics, hormones, excess perspiration, tight clothing, skincare products, environment, personal habits or anything that can clog your pores can be a potential body acne cause. Though body acne can occur to anyone but it is particularly common for athletes and people who workout or play sports frequently. When sweat stays on the skin for too long it get mixes with bacteria, enhancing the probability of dirt, oil and dead skin cells getting trapped and clogged inside the pores, leading to acne breakouts. Tight clothing can also lead to body acne by refraining your skin from breathing freely, thereby trapping elements that can result into acne inside the skin pores. First, I will tell you 4 tips to help control and prevent body acne and then suggest 3 body acne cures. Fortunately, the same lifestyle habits that help prevent facial acne can also help in preventing and controlling body acne. How To Prevent Body Acne? (i) Wear natural fibers, or fabrics that allow your skin to breathe freely. (ii) Wash your bed sheets and pillowcases regularly as dead skin cells can build up on linens – a potential cause for body acne. (iii) Shower as soon as possible after any physical activity that causes you to sweat such as when you get back from the gym or beach. This way you will be rinsing off all the oil, sweat, and sunscreen that can otherwise build up around the hair follicles. (iv) Experiencing acne where you carry a backpack or purse? Carry a bag with your hands instead. How To Treat And Clear Body Acne? Maintaining your body’s skin clean and hydrated, exfoliating dead skin cells and keeping your pores clear of oil, debris and bacteria will help prevent body acne. But should you get body acne, follow the following treatments. Body acne can be treated with the similar ingredients and products, except that you may need slightly stronger products for clearing away body acne. Wash the affected areas with a gentle body wash that contains salicylic acid. Use it consistently. If you use a salicylic acid body wash every day, it helps reduce inflammation and unclog pores. We recommend Neutrogena Body Clear Body Wash, Salicylic Acid Acne Treatment. This effective yet gentle acne body wash contains 2% Salicylic Acid, a proven acne-fighting ingredient. It treats and helps prevent breakouts on your back, chest and shoulders without over drying or irritating your skin. Its rich, foaming lather rinses completely without leaving pore-clogging residue. Your skin will be left feeling clean and refreshed. Can You Use Body Wash Containing Benzoyl Peroxide? Although you can also use a body wash containing benzoyl peroxide, but I recommend it for treating breakouts on the face. I don’t recommend it for the body because it tends to bleach fabrics. After washing allow your skin to dry and apply a spot treatment product. I recommend Clean & Clear Advantage Acne Spot Treatment. This unique acne spot medication dissolves surface oils on the skin allowing the acne-fighting medication to penetrate into pores and clear pimples fast, without over-drying your skin. This breakthrough formula starts to work on contact to quickly reduce the size and redness of pimples. In fact, 100% of people in a clinical study showed improvements as early as day one! Never use grainy scrubs because you may end up overdrying the skin, which will cause your skin to produce more oil leading to more breakouts. Moreover, the skin on your chest is very thin and can scar in case you accidentally remove the skin. Instead, I recommend using a soft shower puff once a week with the salicylic acid wash. Use a soft scrubbing motion over your chest and back. Make sure to immediately wash the pouf because they are breeding ground for bacteria.